A German word meaning ‘in bad taste’, kitsch was traditionally known for its bold, and often awkward combinations of colours, patterns, textures and styles, a combination that produced exaggerated sometimes garish results. Today, it is recognised as an interior design style in its own right. Because it still sits precariously on the edge of ‘bad taste’, it is not an easy style to get right; perhaps this is because there simply is no textbook definition or how-to guide. The style relies on personal interpretation and measured application, and whether it is good or not is often a matter of degrees. 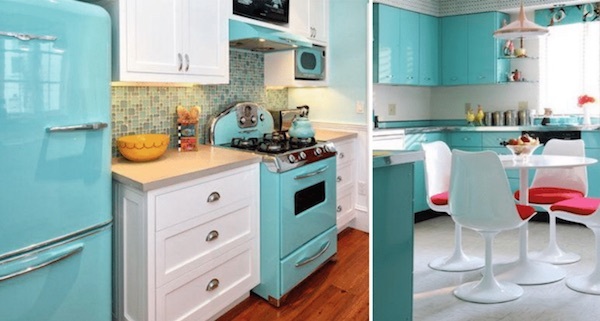 If you are brave enough to put the kitsch in your kitchen, we have some advice. 1. Go bold on colour but restrict your colour palette to one or two colours. 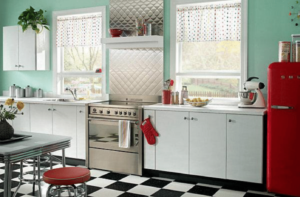 This red and mint combination is classic kitsch, as is the checkered black and white floor! 2. Use colour strategically, by choosing a neutral colour for your permanent fixtures such as kitchen cabinetry and introducing colour on the walls and with appliances and accessories, a change later on is not too costly. However, if you are going to commit then commit and ensure you invest in good quality fittings and fixtures. 3. Use retro furniture such as a Formica dining set, padded diner-inspired stools or oilcloth upholstered chairs. 4. Kitsch interior style gives permission to express or should we say expose your dark décor secrets, and it never judges. Be it a pineapple clock, a Tretchikoff print or your grandmother’s tea set, it can find a home in kitsch. 5. If you are looking for just a touch of kitsch, or a nod to mid-century design, choose a feature wall or design element and pay homage that way. 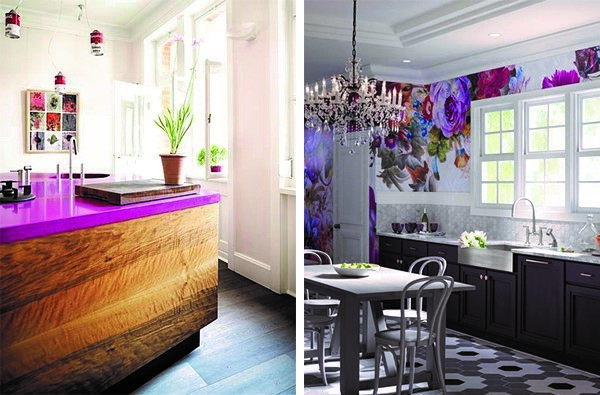 Such as the bright island counter top or the wallpaper feature wall shown below.